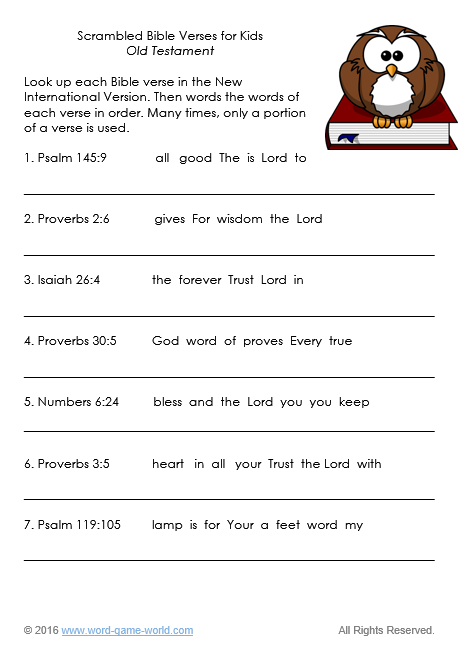 Here are two Bible Worksheets for kids featuring incomplete scripture verses. Children must fill in the blanks using words from the word box on each page. Your kids will be learning important verses as they complete these fun pages. Here's a peek at Page 1 of the printable version. The full text of also appears below for your convenience. Here's a look at the printable page. The entire text is shown below. The verses above are taken from this list of 15 Key Kids Bible Verses. Use this free, printable version at home or at church. Scrambled Bible Verses for Kids - Find a set from both the Old and New Testaments for your kids to unscramble. Great practice for learning the Word of God! Noah's Ark Bible Crossword Can you answer all these clues on one of the most famous events in the Bible? Who Heard It? - Can your kids identify what biblical character God was speaking to in each statement? Can you? 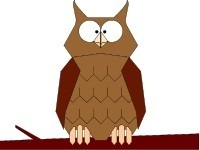 Bible Coloring Sheets - Ask kids to finish the kids Bible verses before they color the picture. Fun, unique printables for your children! Bible Bingo Game Old Testament Bible Bingo at its best! Play it at your next family night or youth group meeting. Bible Puzzles for Kids, ABC style! Kids must remove each letter of the alphabet to reveal in important Bible verses. It's one of our new, fun Bible worksheets for kids! Check out our huge collection of Free Bible Games!